Energy savings ... Geothermal will result in 25% – 75% lower heating costs and 30% – 50% lower cooling costs and will pay for itself in anywhere from 2 - 7 years. Clean and quiet ... Geothermal doesn't burn fuel, which means no potential carbon monoxide issues, and the unit is located indoors — out of the weather. Low maintenance ... 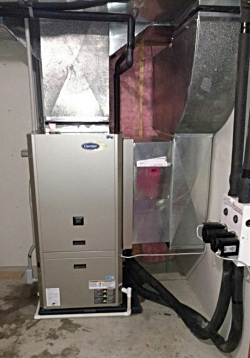 Homeowner maintenance on a geothermal unit is simply to change air filters. “Green” factor ... Geothermal is recognized by the EPA as the most environmentally-friendly heating and cooling technology available. Because geothermal moves heat from the ground to your house rather than creating heat, it is more efficient than gas furnaces. Gas furnace efficiency is never more than upper 90’s, whereas a good quality, professionally installed geothermal unit will have a COP (coefficient of performance) of around 4. What this means to the homeowner is that for every watt of electricity used, it will produce 4 watts of heat -- that's 400% efficient! Central Illinois winters can be frigid, and occasionally the backup furnace will have to run, but not enough to offset the energy savings of geothermal throughout the entire year. Contact us for a free evaluation and estimate on geothermal for your home. ©Copyright 2015 - 2019 Steidinger Brothers, Inc. All rights reserved.